Here's a look back at the Eagles' 51-23 win over the Denver Broncos as it unfolded in real time Sunday afternoon at Lincoln Financial Field. 4:44 4th — Eagles 51, Broncos 23: Corey Clement scored his third touchdown of the day, this time with a run from four yards out. 8:17 4th — Eagles 44, Broncos 23: Denver's Von Miller sacked Nick Foles and stripped him of the ball, and Brandon Marshall took it 19 yards to the end zone for a touchdown. 9:45 4th — Eagles 44, Broncos 16: Denver's Brock Osweiler threw a touchdown pass from just outside the goal line to Demaryius Thomas. 3:00 3rd — Eagles 44, Broncos 9: Carson Wentz threw a four-yard touchdown pass to Alshon Jeffery. Jake Elliott missed the extra point. 7:32 3rd — Eagles 38, Broncos 9: Corey Clement took an option pitch from Carson Wentz two yards for a touchdown. 1:20 2nd — Eagles 31, Broncos 9: Jay Ajayi broke loose and raced for a 46-yard touchdown run. 3:07 2nd — Eagles 24, Broncos 9: Brandon McManus kicked a 24-yard field goal. 9:15 2nd — Eagles 24, Broncos 6: Carson Wentz threw a 27-yard touchdown pass to Trey Burton. 11:10 2nd — Eagles 17, Broncos 6: Brandon McManus kicked a 53-yard field goal. 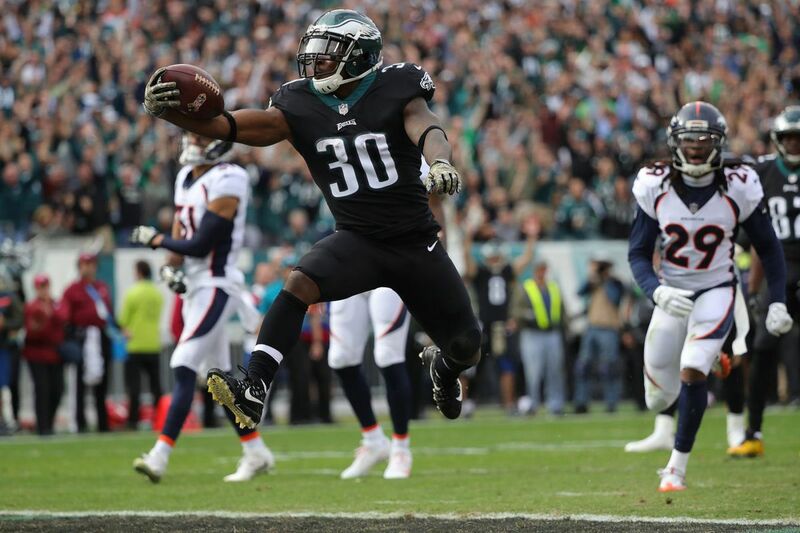 0:53 1st — Eagles 17, Broncos 3: The Eagles capitalized on an interception by Patrick Robinson, as Carson Wentz fed Corey Clement for a 15-yard touchdown run. 1:58 1st — Eagles 10, Broncos 3: Jake Elliott extended the Eagles' lead with a 45-yard field goal. 6:34 1st — Eagles 7, Broncos 3: Carson Wentz floated a pass to Alshon Jeffery, who took it to the house for a 32-yard touchdown play. 10:35 1st — Broncos 3, Eagles 0: Temple and North Penn High product Brandon McManus gave Denver the early lead with a 52-yard field goal. Click here for the full game play-by-play.